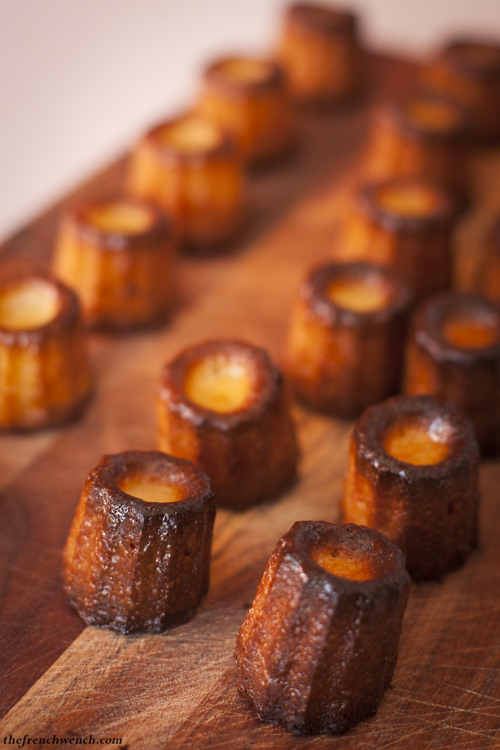 Canelés are experiencing a revival in France at the moment, they are all the rage! They’re even about to be sold in McDonald’s at the end of the month! (See Figaro article here). McDonalds is already surfing on the macarons’ wave and is also offering “Tartines” for breakfast in their McCafés in an effort to adapt to the French market. 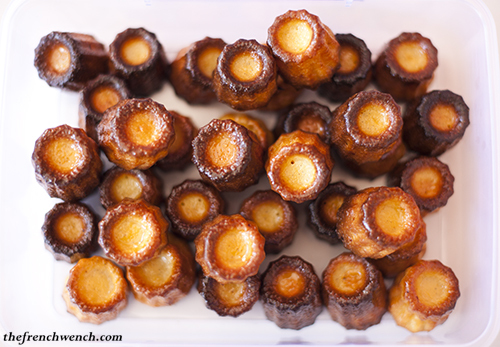 I remember the first time I tasted canelés was about 3 years ago in… Sydney, of all places! An ex-colleague from Bordeaux had made some and brought them at work, and although they didn’t look like much (small, burnt, dry), I was surprised: they were in fact the most delicious things I’d had in a while! I loved the contrast between their crunchy caramelised crust and the smooth vanilla custard inside. I found them later at Black Star Pastry, and at some stage another Frenchman was making them and selling them to Sydney cafés but not anymore unfortunately. Canelé moulds are traditionally made out of copper and are quite expensive (you can see an example here). 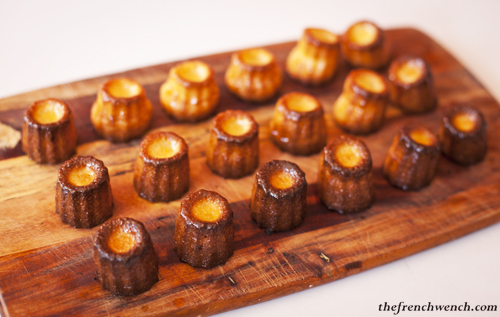 They look beautiful and are apparently the best to get that great caramelized crust, but they are not very convenient when it comes to removing the canelé after cooking, you need to butter them generously. Luckily thanks to work I was able to buy myself these great little silicone moulds from France. It made my task very easy indeed! A regular canelé is about 55mm diameter and 50mm high, but I chose the mould for Mini-canelés (Diameter: 35mm), they are just too cute and you can make more of them! After a few weeks of just admiring the mould sitting on my kitchen bench and a few cheeky remarks from my partner, I finally decided to make canelés for Fathers Day! Gently warm the milk, butter and split vanilla bean over low heat for 10 minutes, without bringing to the boil, then let it cool down. 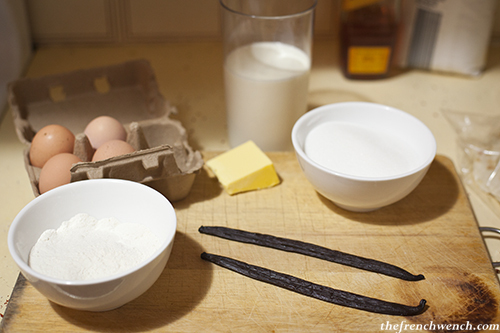 In the meantime whip the eggs and sugar until you obtain a pale and smooth mixture, then add the flour. 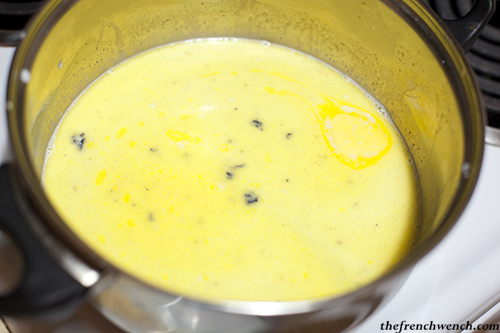 Add the milk onto the eggs flour mixture and whip it until smooth. Add a slash of rum. 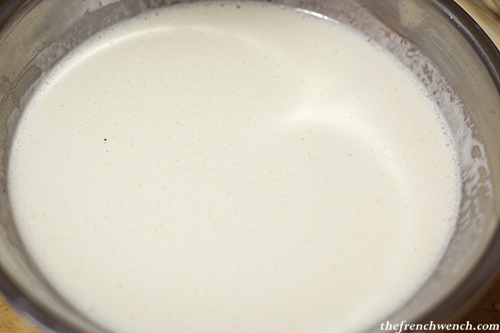 Put the batter in the fridge overnight, as it is better once rested. The following day, whip the mixture again and pour it into the mould at about 2/3 of the height, as their volume increases during baking. Even though silicone moulds are pretty hassle-free, I still buttered this one in case. Put in a pre-heated oven at 210°C for 20 minutes, then lower the heat to 180°C for another 50 minutes. 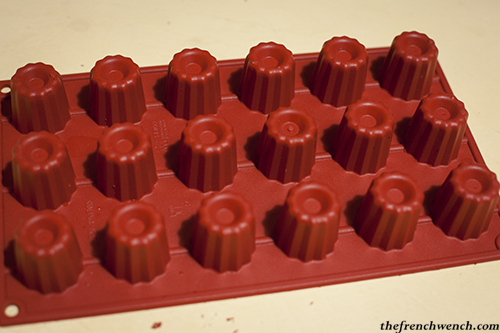 Take them out and let them cool for 10 minutes before removing them from the mould. You can eat them warm or cold, they won’t last long anyway! This entry was posted in French Specialties, Recipes and tagged Bordeaux, Canelés, Cannelés, pastry, patisserie, Recipe. Bookmark the permalink. They certainly helped make it a most enjoyable Father’s Day for this dad- thanks again Sandra. Wow, these look excellent! And with the substitute silicone moulds being used instead of copper ones, I think they turned out beautifully with that signature dark, golden crust. Wow I have never tried these before! They look amazing – definitely have to try this recipe one day. Hopefully I can find a mould somewhere on ebay? @Johnno No worries, glad you enjoyed! 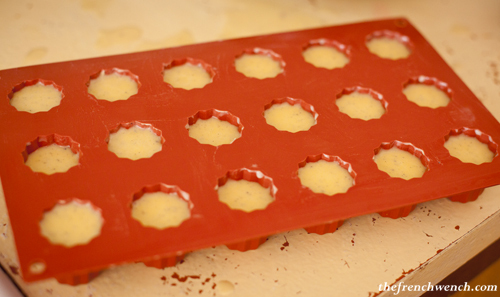 @MlleDelicieuse Silicone moulds are the bomb, thank God for them! @Mel I saw some on Amazon as well. Vive le online shopping! Interesting what you mentioned about McDonalds, would be nice if they were that sophisticated here. Re. McDonalds, it is quite funny to see the effort they put into pleasing the French market, but it is understandable when we know that France is their 2nd biggest market after the US!!! I’ve never tried those until my friend Gaby made them to sell to cafe, I think that must be the same person that you mentioned as he had to stop. There are so Goooooodd!!!!!!!! Do you put the silicon moulds on a cookie sheet or with nothing under them for their time in the oven? Thanks. Hello! I didn’t use a sheet, I put the mould straight on the oven rack. That said, it’s not ideal because it spills everywhere, so I might use one next time! Or better, a metal mesh one, like the one seen on that blog http://chezpim.com/bake/canele-recipe-method, gotta find one like that!